Purple Bunny Bento, a photo by sherimiya ♥ on Flickr. I know what you're thinking: they just had salmon this week already. But actually the bento from Monday was a late post from a few weeks ago -- so this is the first salmon of the week! I broiled this one with a cajun spice mix, and laid it upon some white/brown/quinoa/millet mixed rice in the lettuce cup. As usual, I roasted some veggies at the same time; this time some pencil asparagus which I tossed with olive oil and parmesan. There's also carrots, peapods, a section of fruit (strawberries, blueberries, grape tomatoes), and a steamed Okinawan sweet potato bunny with rice stick whiskers, because I realized at the last second that Easter is coming in a week or so, and I haven't made any Easter bento yet. Just in case the bunny doesn't cut it, there's a little fuzzy chick to get the point across. Happy Spring! Cute bento!! and I love that tiny cute fuzzy chick ... too cute!! ... thanks for the smile!!! Happy spring to you too! I haven't been able to make any bentos lately so seeing yours makes me soooo hungry!! That lil chick is so darling! 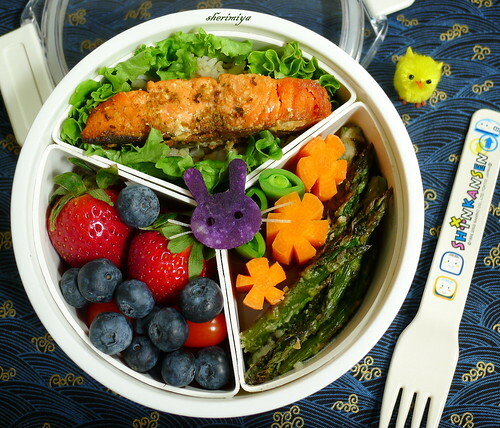 Love this springy bento ^^. Have a sweet weekend friend!! Happy Spring Sheri! I'm looking forward to seeing your Easter bento! I have asparagus in the fridge. I should do your quick Parmesan method with it. I have never made it but sounds great! You should try it; I'm sure they'll like it too! 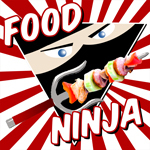 I'm thinking...how yummy and fabulous this bento looks! Jewel tones and spring motifs are a delight here. Happy happy weekend, Sheri! Just as the jewel tones appear in your bento and give me a smile every day, Jenn. I gotta tell you, I'm so so jealous your kids eat so healthy and yummy. Seriously. It says a lot about you as a great mom that you are but also how their taste buds are so much more sophisticated than my kid's. Your presentation as always is so gorgeous! You are always so thoughtfully sweet, Chantale. I don't do anything especially over the top. My kids just don't want to miss out on whatever I'm "yummmmmm"ing over! Hehe. Your lunches are very inspirational especially since I'm so stuck in a rut. My kids are getting bored with the same old meals. Thanks for all your great ideas! Thank you for your kind words; I'm glad you're finding ideas for your kids' lunches!